Candle Movement Sale: 20% off + Free Shipping. What is a Candle Movement Sale? We have to clear out some of the summer scents to make room for the delicious new Fall candles. We will be offering a 20% off sale for the next 2 weeks, so get yours now. AND, if your purchase is more than $50 we will ship to you for free!!! Fig | Orange - sweet, refined fruit-forward aromatic with resinous notes quietly subdued by mild spice, orange citrus and slight woody musk. Violet | Carnation - Mild, woody and sweet with piquant, bright and vivid floral undertones. Grapefruit | Apricot - Zesty mix of sweet and slightly bitter, herbaceous citrus smell, the grapefruit undertones. P.S. I Love You - Notes of bright lemon, basil, rosemary and desert sage brings this candle to life. Vetiver | Rose - Bright green notes and refreshing citrus with a subtle blend of buttery rose and nutty notes with hints of earth and wood. Lemongrass | Lime - Lemongrass and Lime essential oil. Holiday shipping deadline: December 21st. The countdown has begun and holiday shopping will soon be wrapping up! The Wooly Wax Candles production facility is in high gear, fulfilling holiday orders and custom scented candle collaborations. In fact, we had busiest week of the year last week! If you’re looking for last minute holiday gift ideas and holiday deals, Wooly Wax Candles can help ease the last minute shopping crunch. The Mile High scent makes a perfect holiday candle and our little travel tins make the perfect stocking stuffer for those last minute Christmas gift ideas. We will be offering holiday shipping priority mail until December 21st and same day shipping on orders placed before 3pm. Free shipping is available on orders of $50 or more using coupon code: FREEHOLIDAYSHIPPING. Wooly Wax Candles would like to thank you for your support and wish you a Happy Holiday season and very Merry New Year. With the holiday season in full swing, Wooly Wax Candles is extending its online sale through Cyber Monday. Order online this Monday, November 30th and save on any of the Wooly Wax Candle line up, travel tins and custom candle bundles. From stocking stuffers to last minute host gifts, Wooly Wax Candles have you covered. Check out our holiday specials on our collection of adorable travel tin candles, candle bundles and the entire Wooly Wax Candles line including the new, hot-selling Mile High and P.S. I love you scents. Our online friends are rockin' the holiday sales as well. Check 'em out! Candles make great holiday gifts! 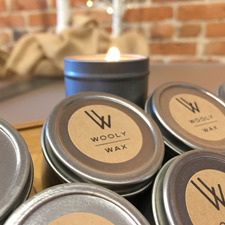 Bundle up with Wooly Wax Candles this Small Business Saturday! If you've begun your holiday shopping this year, we're a little jealous. If not, we’ve got you covered. Candles make great gifts, and bundles of candles make your holiday shopping a lot easier. We know timing is everything – rather than brave the crowds at the mall on Black Friday this week, consider supporting your local small businesses this Saturday, November 28th for Small Business Saturday – a day created specifically for young, local companies like Wooly Wax Candles! We have lots of friends who also own small businesses, which is why we chose Small Business Saturday to launch our Holiday Candle Specials. Doing so helps us celebrate and thank our local small business and online retail friends. Candles make great stocking stuffers, and are terrific for those last-minute host gifts at all those holiday parties. We have two new additions to the Wooly Wax line – Mile High and P.S. I love you – both have been very popular "destination" candles. For those of you here in Denver with family visiting, who wouldn't love a candle from Colorado to take home with them? Get online this Saturday, November 28th, and visit the Wooly Wax Candles shop for incredible holiday specials on Travel Tins, Candle Bundles and any of our original Wooly Wax Candle line up. Enjoy Thanksgiving and may your holiday shopping go smoothly this year! Last week I was in Palm Springs, one of my favorite places to hang with friends and just be. I was there to celebrate my birthday, and we stayed @SparrowsLodge, a spectacular place to decompress. It was quiet, relaxing and all we did was sit by the pool, play cards by the fire and walk the property, enjoying the palm trees and full moon that night. As I walked the grounds, I ended up in the herb garden, and pulled a lemon off the pergola, and soon I had a handful of herb goodness that made me want to create something to remember this trip by. Sometimes we have special times with special people and we want to remember those moments. This was Palm Springs. This will be one of my next candles. The Official Launch Of Wooly Wax Candles! It's official! We are live. Website is up. Instagram, Facebook, Pinterest and Twitter accounts are locked and loaded and 8 cases of Wooly Wax Candles have just been delivered to two local shops; HoneyComb & Co. and Dragon Fly Apparel. Please stay tuned as Wooly Wax Candles and Sub Rosa Mercantile team up to produce a special scented candle sold exclusively online and at Sub Rosa. This should be fun!